Before contacting us about online or mailed submissions, please review our guidelines. Our office is open Monday through Friday from 10 am-5pm, except for holidays and UMass campus closings. 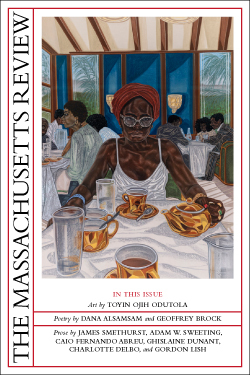 To contact our authors, email our Managing Editor at massrev@external.umass.edu, or send mail to “[Author's Name], c/o Mass Review” at the address below. We do not give out the personal contact information of our authors.